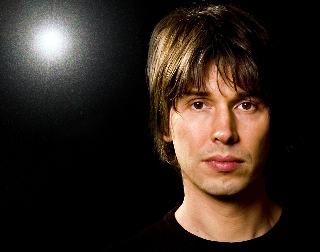 Professor Brian Cox OBE began his career not as a physicist but as a rock star, when his band Dare signed a deal with A&M records in 1986. Dare recorded two albums and toured with Jimmy Page, Gary Moore and Europe before breaking up in 1992. Brian then joined D’Ream, whose song ‘Things Can Only Get Better’ was famously used by Tony Blair as the Labour Party election song in 1997. During the D’Ream years, Brian obtained a first class honours degree in physics from the University of Manchester and a PhD in High Energy Particle Physics at the DESY laboratory in Hamburg. In 2009, Brian became Professor of Particle Physics. In 2015, he became The Royal Society’s Professor for Public Engagement in Science. Brian has received numerous awards for his work in publicising science. Already a Fellow of the International Explorers Club, in 2006 he received the prestigious British Association Lord Kelvin award for his work in promoting science to the public. In October 2010, Brian visited Buckingham Palace to collect his OBE for his work in science. As well as influencing young people in the UK, his talks have inspired many audiences around the globe. As an author, Brian’s books include ‘Why Does E=mc2?’ (DaCapo 2009), ‘Quantum Universe: Anything that Can Happen Does’ (Penguin 2011) and ‘Wonders of the Solar System’ ‘Wonders of the Universe’, ‘Wonders of Life’ and ‘Human Universe’ (HarperCollins) based on his hit BBC programmes. As a live performer, Brian’s theatre shows include ‘An Evening of Scientific Phenomena’ and ‘Making Sense of the Cosmos’ (Australia, 2012 & 2014) and his popular comedy/science shows with Robin Ince include ‘Infinite Monkey Cage’ (USA 2015), as well as their annual Christmas shows (UK, 2010-2014). Brian’s ability to present science in an engaging manner makes him a popular television presenter, radio broadcaster and chat show guest. His credits include Human Universe – BBC2 (2014), Stargazing Live – BBC2 (2011 to current) and Wonders of Life – BBC2 (2013).